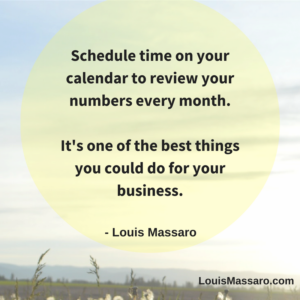 Are you reviewing your numbers on a regular basis? Do you have a set of reports that you are using to run your business? In this episode, I’m sharing a valuable set of moving company reports that you should be looking at weekly and monthly to run your moving company. Rule #1 of 10 Rules of a Profitable Moving Company is Know Your Numbers. 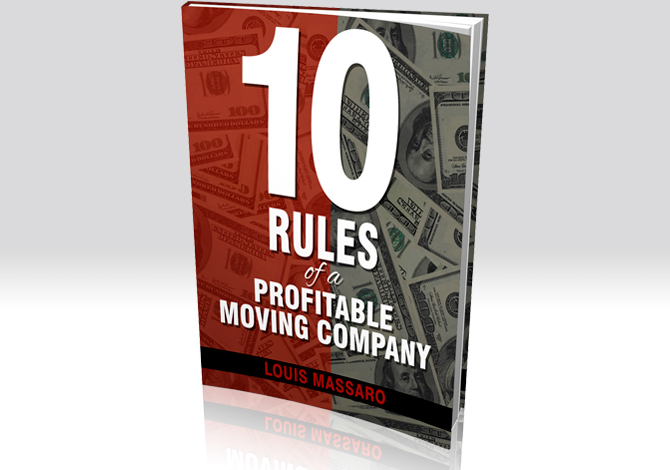 In my new eBook, 10 Rules of a Profitable Moving Company. I write about ten rules that if followed consistently will lead your business to make more money. 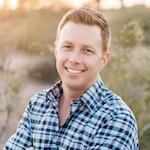 Once I implemented rule #1 in my business, it allowed me to scale and grow to a level that I would have never achieved without knowing my numbers. 1 .Profit and Loss Statement – Most people use this just to turn over to the accountant at tax time. If set up correctly and reviewed monthly, you can use your P&L as the GPS to navigate your business. The P&L will show you all of your revenue, expenses, and profit. If you are not currently reviewing you P&L monthly, you should start. It will give you tremendous clarity and insight into how your business is performing. 2. Marketing ROI – Modern day marketing is complex. There are many different sources of marketing you could invest in. How do you know what is working and what is not? How do you know which sources are profitable and which ones you are losing money? Your Marketing ROI (return on investment) report will tell you how each source of marketing is performing. It will give you your booking percentage, the cost of acquisition, percentage of revenue spent and average revenue per source. 3. Completed Moves Report – This moving company report will tell you how many moves were completed, total revenue, packing revenue, average move, and estimate vs. actual totals. You may have a good feel for what is going on in your business, but getting in the habit of reviewing this weekly and monthly will make you aware of things you might not see on a daily basis. 4. Sales Rep Performance – Review this weekly and monthly. This is where you will be able to get an overall understanding of how your sales team is performing. You want to see how each moving sales consultant is doing on an individual basis. This report will tell you things like how many leads they received, how many quotes they gave, booked jobs, on-sites, and cancellations. Having this information leads to great coaching opportunities to help them improve. These four moving company reports are the bare minimum of you want to be reviewing every month. There are many other reports that will give you great insights into how your business is performing. Start with these four. The key is consistency. Schedule time every month to review these reports. Make it a priority. Treat it as if your business depends on it because it does. Hey my friend, this is Louis Massaro, author of 10 Rules Of A Profitable Moving Company and founder of Moving Mastery. Today is a big, big episode. We’re gonna be talking about the 10 rules of a profitable moving company. I just recently wrote an e-book, The 10 Rules Of A Profitable Moving Company. It’s free, it’s on my website. Make sure you download it. But today, I wanna go over rule number one of the 10 Rules of a Profitable Moving Company. And that’s, ‘Know your numbers.’ In the 10 rules, there’s no real particular order of importance, but know your numbers is definitely the number one rule to becoming a profitable or a more profitable moving company. And let’s talk about the numbers for a minute, and which numbers I’m referring to. The first set of numbers or reports, because the numbers go into a report and that’s how you essentially know them, and that’s how you know your numbers by viewing the reports. So the first set of reports that you wanna see that is by far… You have to be doing this on a monthly basis, is your profit and loss statement. And I know some of you may be watching and you may say, “Yeah, I know. I look at my profit and loss, I look at it quarterly, or I check it out once a year.” Or, like a lot of people out there, it’s only being used to turn over to the CPA to do the taxes every year. And I’m only telling you this information because that’s what really helped propel me to the next level. When I first started, I didn’t know what I was doing. I didn’t know anything about numbers or books. I was a 19-year-old kid. I didn’t even know how to write a check. I would go buy moving supplies at the moving supply store and bring cash that I had from the job and just pay ’em. My CPA finally said, “What are you doing? Why are you doing that?” I was like, “Why make two trips? Why take the money out of the bank and then have to write the guy a check? It seems like double work to me.” Obviously, I learned that that’s not the right way to do it, and I got my books in order, eventually I hired book keepers, and got all that under wraps. But it’s not something that you’re just… When you go open a business that anyone just teaches you. But you have to do the profit and loss. Let me tell you why it’s so important. And you wanna do it monthly. And for those of you who don’t know what a profit and loss statement is, it’s basically all the revenue that you made in that period, let’s just say for the month. All the revenue that came in, and then all of your expenses. So you take the revenue minus the expenses, and then that’s your profit. But you could drill down a little bit further and start getting into percentages. This helped me one time a lot, actually. But one time it helped me where I was looking at my P&L on a monthly basis, like I always do, and I do it in two stages. I first take a look to make sure everything’s in the proper category. For the last 15 years I had book keepers doing the work, but it’s my company, and I wanna make sure that everything is correct and they put every single charge, and every single source of revenue in the right spot. So I go through and I check the detailed profit and loss, and I just make sure everything is in the proper category. Then once it is, I print off the summary and I go through the summary. You’re gonna be able to tell so much about what’s going on in your business. There was a time where I’m sitting and I’m looking at the P&L, and I’m like, “Why is my fuel percentage so much higher this month than it’s been over the previous months?” And the fuel price was actually down, fuel prices went down. As I started to drill down into it to see why that was, first I thought maybe there was a mistake in the P&L, and turns out that I had a group of movers that were running their own little business at my expense at the fuel station. They were fueling up cars for people, trucks, ’cause it was only diesel, so they were fueling up other people’s trucks and getting half the money in cash. Now I caught this right away, and many of you may say, “Yeah, but I would know that that’s going on.” You know what? I didn’t see it with my own eyes. I was there. I felt like I had a good feel for what was going on in my business, but I didn’t see it. My dispatcher didn’t see it. Nobody brought it to my attention. I found it in the numbers. 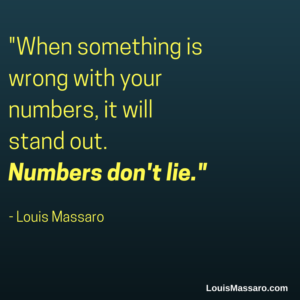 Because when something is wrong with the numbers, it stands out immediately. The numbers don’t lie, they’re black and white. It’s very simple. They are what they are. If the information is entered incorrectly, then they’re gonna be right. So imagine if I didn’t look at that for a year, or ever, I would’ve never known that was going on or it woulda took a lot longer for me to find out. So those are the types of things where every month you find something. Every month you see an expense that shouldn’t be the way that it is, and you’re able to do something about it. It’s just an amazing regular practice to get into with your business. And if you don’t have an accounting software, go online, use QuickBooks online. It’s like, I think, $15 bucks a month. It’s very easy to use, very simple. 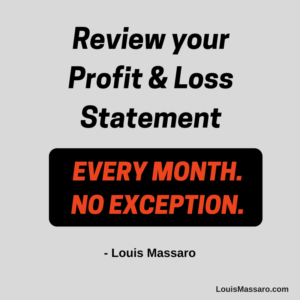 Don’t let your profit and loss statement be something that’s just for the bookkeeper or just for the CPA. And this goes for everybody. I know people with multiple locations, I know people that are van line agents, I know people with very successful businesses and they’re still running their business based upon the amount of money that’s in the bank account. You can get by like that but if you wanna take it to the next level, if you want to drill down to become more profitable, review your profit and loss every single month. Set aside a little time, put it on your calendar and start doing it. Believe me, you’re gonna start finding areas where you can improve and increase profit. The second report that you’re gonna wanna look at again on a monthly basis is a marketing ROI. Essentially, this is like a profit and loss strictly for your marketing. So you’re gonna have all of your marketing, all the different sources, all the leads that came in for all those different sources line item. What the booking percentage was for each one, what your cost of acquisition was for each one. So in other words, how much did it cost to get each one of those moves and then what the cost percentage was. With this report, this… When I finally had my call centre going and I grew it to over 50 sales reps on the phone, this is what really help me scale. Because when you don’t know what marketing is performing and what’s not, you’re scared and nervous to try different sources because what if it doesn’t work? How do you gauge that? How do you judge whether your marketing source is working or not working? A lot of times we count on our sales people like, “Oh, this source is… ” “These leads aren’t really that good,” or “Wow, these are great, the phones are ringing off the hook.” But in reality, it’s not about whether the phones ring off the hook or whether you have to call 100 leads in order to get three jobs, it’s a matter of how profitable they are. 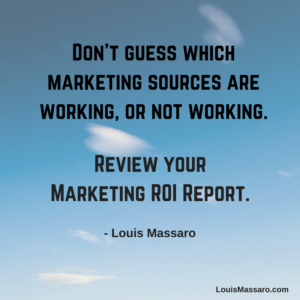 So you need a marketing ROI report to be able to tell you how profitable your marketing sources are. It’s so important, especially, in this day and age, there’s so many different ways to market. It’s not like 10 years ago where you had a Yellow Page ad, some direct mail and a few other things going on. There’s a lot of different lead sources and you may only be getting a few from this one and a few from that one. You want to be able to know every single month how they’re performing, because then from there you can make adjustments. The third report that you’re gonna wanna look at every month is your Completed Moves Report. You’re also gonna wanna look at this one weekly. Weekly and monthly, your Completed Moves Report. So basically the Completed Moves Report is essentially the moves that you did, the moves that you completed. But what was the average move? What was the estimated price versus the actual price? How much packing was sold on each move? When you’re looking at these numbers on a monthly basis, you see things that you can then implement into your business. If you start looking and say, wow, how can we increase sales? How can we increase and bring in more revenue? Well, we could sell more packing. Okay, well if every month you look at your Completed Moves Report and you see that you’re selling, I don’t know on average $50 per move in packing. You say, you know what, let’s… How can we get that to $100 a move in packing? And you come up with a plan and you figure it out and you need to gauge that every month, you need to look at it and see if you’re making progress. Or what happens if your average local move is normally $860? And all of a sudden one month it’s like $620. There might be another problem, there might be something going on that you need to look at or you might be advertising or marketing with a source that’s bringing in very small moves or you may have lost a source of big moves. Having this information, I could try my best to tell you what it’s gonna do for you as a business owner, but only until you have it in front of you will you be able to know how impactful it’s gonna be for your business and what you can do and changes you can make for your business. Very, very, very important. And the last report that you’re… And again these are bare minimum. These are not all the reports that you wanna see but if you’re not doing these, start with these. There’s many more advanced reports that you can get into. You may be doing more now, but to me these are four of the most important reports that you need to be looking at. And this one, again, is another weekly and monthly which is your Sales Rep Performance. You wanna know how every sales person, rep, whatever you call them, moving consultant, how they’re doing weekly, how they’re doing monthly. You can’t just assume that they’re doing good or not doing good, you have to look at this because they could fall off. They could be going through something personally where it’s affecting their mind and they’re not producing the numbers that they’re normally producing. And if you’re able to see that and you’re able to track that trend quickly, you can do something about it. You can pull ’em to the side, talk to them, train them more, maybe they need more training, maybe they need some motivation, maybe they need a higher bonus. Whatever it may be, you need to track that weekly and monthly. I had somebody recently ask me, “What do I do? My sales reps aren’t motivated. Last year, these were their numbers.” Well, first thing you need to do is stop looking at their numbers in yearly… You need to look at them weekly, you need to look them monthly, and you need to help them to develop better sales skills to be able to sell more. So these are the four reports you need to be looking at. And I’m stressing this ’cause I know if you start doing this, you’re gonna be able to make your business more profitable. Not because of what I’m… I’m just giving you what to look at. I don’t know exactly what you’re gonna see when you get it, but I know when you get it, if you’re running a business and you’re a business owner, you’re smart enough to know, that by this information, I know what my next step is. I know by what I saw in Completed Moves, that I need to take action and I need to do something to raise our average move. Maybe I need to raise our price to get that up higher. My profit and loss statement. Maybe your books are a mess right now. Don’t get discouraged. If you haven’t been looking at them ever, or you only look at them once a year or occasionally glance at them or just something you use for the CPA, understand it’s gonna take you a little bit of time to clean them up and get them in order, but it’s gonna be the best investment of time you ever made, trust me. Your marketing ROI, don’t guess anymore what’s working, what’s not working. Don’t be fooled because you have a marketing source that makes the phones ring off the hook and it’s exciting and there’s adrenaline, but in reality, it might not be profitable. You don’t want moves at any cost, you want moves at a certain cost, to where they’re profitable. And what else is there? Your salesman’s performance. This is huge. If you’re coaching, and you’re doing enhancement training with your sales team, and you’re looking at where they’re struggling, and you’re helping them overcome that so that they could sell more for you and your company, you need to be looking at that weekly, monthly. Once you’ve set up the templates for these, and once you’re able to figure out where you’re gonna pull the data and where you’re gonna get the information from, it’s easy. Then you schedule some time once a month. Yes, you. Don’t have somebody else review these reports, this is your business, and your profits. This is rule number one of 10 Rules of a Profitable Moving Company. It’s about becoming more profitable. And when you’re more profitable, the owner of the business receives the benefit. So take the time, schedule it on your calendar, whether it’s a couple different days where you have two hours a day, or whether you take one full day a month and you just go through all the numbers. Trust me, it’s gonna be one of the best things you ever did. Until then, I hope this was helpful. Go out, profit in business, thrive in life. I’ll see you next time.